I got in touch with The Folio Society a couple of months ago as they seemed like the perfect beautiful book collaboration; their editions really are something special. I was offered two titles for review purposes and, after selecting A Room of One’s Own for Feminist Book Fortnight, I struggled to narrow down my second choice. 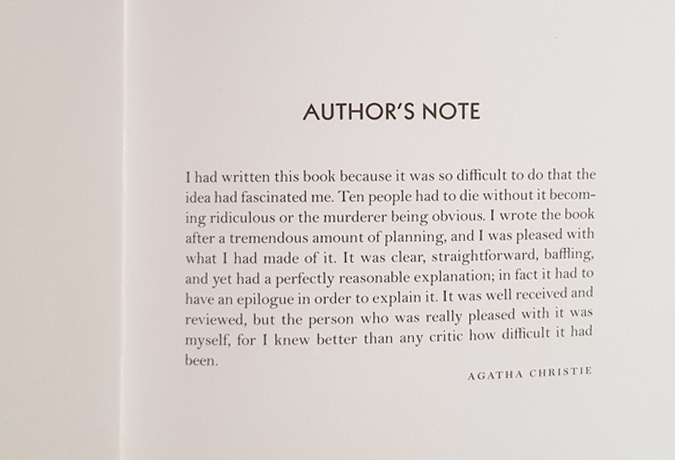 Having recently read 100 Books That Changed the World, I thought about my literary bucket list and told their wonderful PR team to surprise me with an Agatha Christie title of their choice. 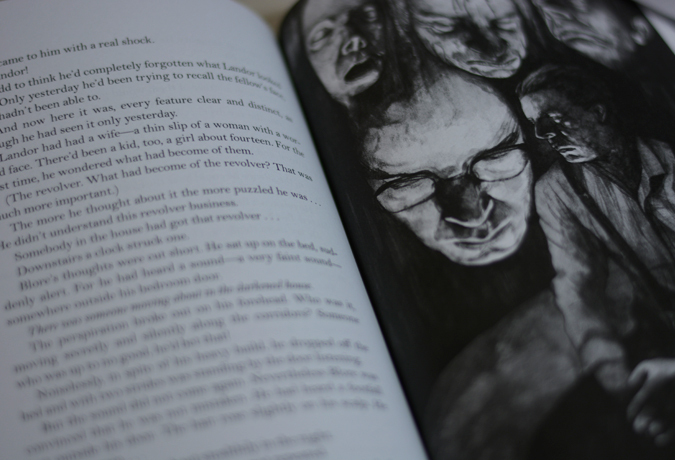 When I received a copy of And Then There Were None, I was instantly drawn to David Lupton’s haunting illustrations. It became apparent as I read more of the book that he was the perfect choice of illustrator; he really captured the mood of the book. Christie starts by introducing us to eight people who have been invited to Soldier Island. When there, they meet the two housekeepers and soon realise that their host makes no intention of showing – and may not even exist. When members of the party start dying under suspicious circumstances, the survivors begin to wonder who brought them to the island and if any of them will make it off alive. 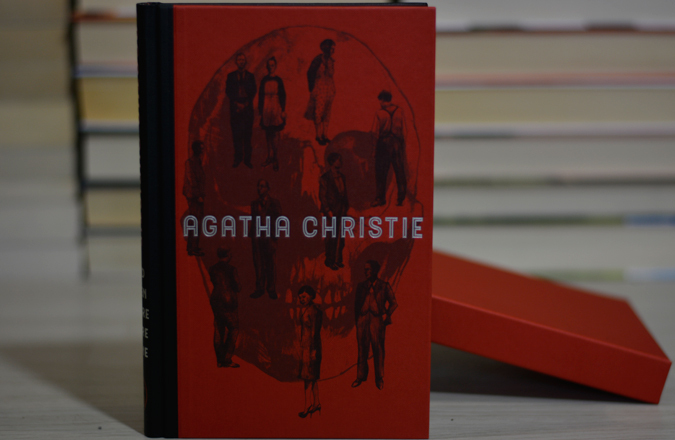 Described on the Folio Society website as “The greatest mystery by the greatest mystery-writer of them all – the crowning achievement of the “Queen of Crime””, And Then There Were None really is the ultimate page turner. The short chapters kept tempting me to read ‘just one more’ and I devoured it in two days. I grew up watching Poirot and Miss Marple adaptations on TV with my parents, trying to figure out whodunnit first and, I have to say, I didn’t see this one coming. The brilliant thing about a truly great mystery is it demands a re-read. I instantly wanted to turn back to the start and see where all the clues were. I’m definitely an instant fan and will be working my way through more of her extensive bibliography. Are you a Christie fan? Which book should I read next? I love agatha, and i advice you to read partners in crime…. I’m a fan and I read Christie’s books in my youth 🙂 I think I can re-read them soon because I don’t remember much of it by now. I hadn’t heard of The Folio Society before so I’m checking them out. Your edition looks wonderful, with the extra illustrations! If you like this type of books I can recommend Guess Who by Mc George, An Unwanted Guest and The Seven Deaths of Evelyn Hardcastle too! I need that edition! It’s so beautiful. I was going to suggest The Murder or Roger Ackroyd but it looks like londonlifewithliz beat me too it! Next on my Agatha list is the ABC Murders, it keeps getting recommended to me lately! I love the Folio editions, too – they make wonderful gifts and are books that people will treasure forever. In terms of Agatha Christie recommendations, you can’t go wrong with ‘The Murder of Roger Ackroyd’. Not only is it a great read (and a great way to tet to know Hercule Poirot), the ending will stay with you forever.